According to a local story, about many years ago a Nanaimo (Vancouver Island, B.C.) 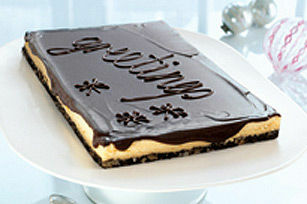 housewife entered her recipe for chocolate squares in a magazine contest. She chose to name the entry after the city where she lived. The entry won the prize. 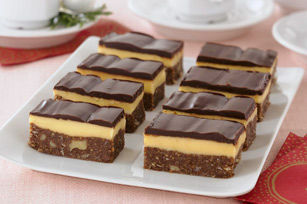 These dessert bars were born! Some American tourists claim sovereignty over the dessert, referred to as a "New York Slice" which is sold in many other places in the world. Nanaimo residents naturally disagree with this theory, however. 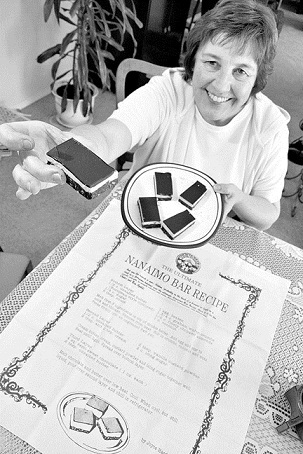 In 1986, Nanaimo Mayor Roberts held a contest to find the ultimate Nanaimo Bar Recipe. During the four-week long contest, almost 100 different variations of the famous confectionery were submitted. The winner: Joyce Hardcastle. 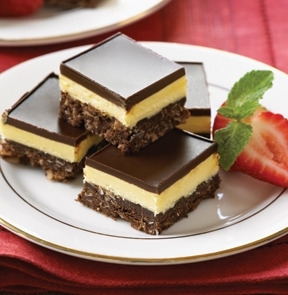 The bars start with a crumb base, followed by a layer of light custard buttercream, and the crowning glory is a smooth and glossy layer of semi-sweet chocolate. Actually and honestly, I remember my Mother making these cookies years before that 1986 contest. The restaurant recipe is the same as my Mother's and Joyce Hardcastle’s. Preparation time: 40 minutes. Serves 12. The restaurant dessert recipe for these cookies uses walnuts, not almonds, and uses a simplified method rather than three steps. Try them both and see which one works best for you. Now you have two really good recipes for this famous dessert. Enjoy the recipes and the company of those you share them with!